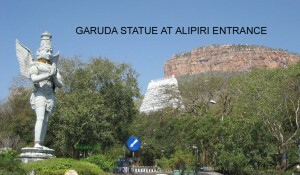 Alipiri Mettu is opened for 24 hours so pilgrims can start their journey anytime. 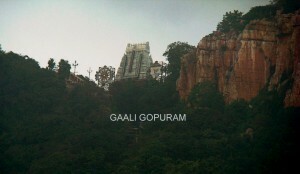 Alipiri Mettu is 4 Km from Tirupati Bus station and Railway Station. T.T.D runs Free buses from Railway station, Bus Station and T.T.D Cottages in Tirupati to Alipiri Mettu. 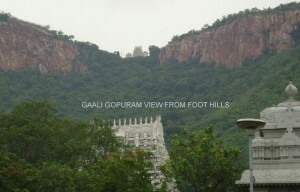 Devotees who wish to go by walk to tirumala hills can use this facility. Initial 2083 steps will be more time taking, so I would advise not to go fast at while taking steps as you need much energy at later point. 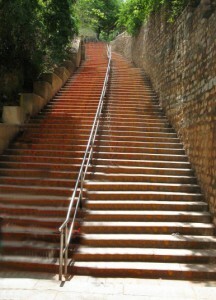 These initial steps are very steep and you can always relax for a while by looking at the beauty around. whenever you feel like tired relax and the cool breeze will takeout stress and strain from you. You can take the support of railings to halt and proceed. Most of the path is covered with concrete roof, so you need not worry about sunlight or rains. TTD has done a great job by making this path so easy to keep going. 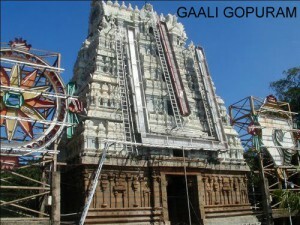 Once you reach to elevated place GAALI GOPURAM, city. Soon after reaching top, there are many shopkeepers who sell refreshments including tiffin items at a nominal cost. If you are too tired, take a break for sometime here and then proceed. From this point onwards the walk would be smoother for next 6 km since the path is more or less flat and you wouldn’t feel the steepness. 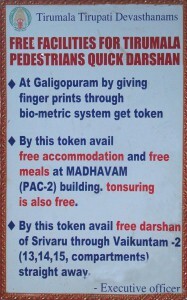 There is a Free Divya Darshan Bio-Metric Token facility is available at GAALI GOPURAM Entrance. And it is open for 24 hours. If the crowd is quite high then T.T.D Will cancel FREE DIVYA DARSHAN Tokens on Saturday, Sunday and Thursday with Prior notice. From here on it is going to be smooth walk. 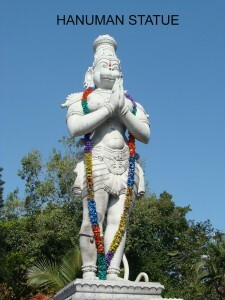 After walking couple of Kms from Gaali Gopuram, you will reach Sri Prasanna Anjaneya Swamy Statue which is on 7Th mile from Alipiri. 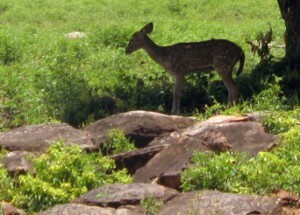 You can find deer park while on the way to Mokalla parvatham. 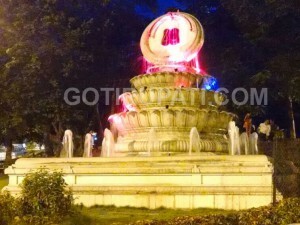 Mokaalla parvatham which stands at Step No. 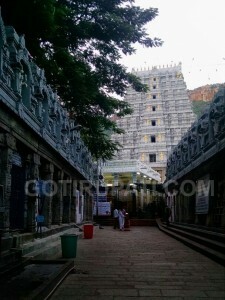 2910 is of 300-400 steep steps, which culminate at the entrance of Tirumala itself. 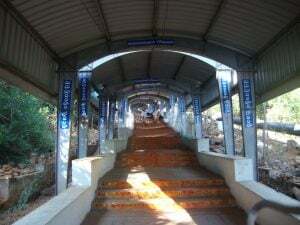 Divya Darshan tokens are issued along the path at 1200th Step i.e 1.4 km from Srivari Mettu entrance. Parking is available for Private Vehicles at Sri Vari Mettu. Vehicles can be collected next day at your convenience. Though path closes by 5:30 pm, security vigilance will be there for 24 hours. Two Wheeler and Four Wheelers can be parked here. T.T.D runs two free buses which start at 4 A.M and is available in Time gap of 45 mins. 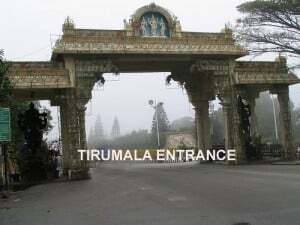 if free buses are not available then there is an alternate way that you can get into bus which goes to Piler, Madanapalli, Baakarapeta, Ramgampeta,Bheemavaram and then get down at Srinivasa Mangapuram Temple(15 km from Tirupati). 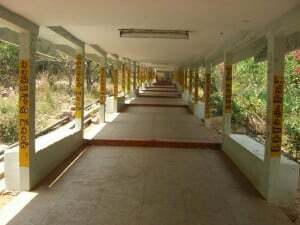 Sri vaari mettu 6 Km (Approx) from Srinivaasa Mangapuram and Srinivasa Mangapuram is 11 Km from Alipiri Entrance. 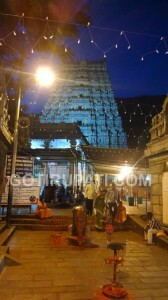 At present, devotees are allowed to trek along the footpath between 6.00 a.m. to 6.00 p.m. in the evening. The route remains strictly closed at night. 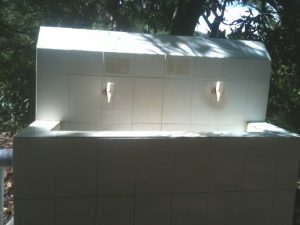 2) About 6-7 toilets are there in the whole path – so toilets are available about every 350-400 steps ! 3) Sunshades covers almost the entire path – no problems even if it is sunny. Lots of people sit on the sides of the steps – there is space and it is clean. Srivari Mettu is a much older pedestrian path to the hill shrine than from Alipiri mettu and is believed to have been used by legendary Emperor Srikrishnadevaraya in the 16th century.However, it had remained defunct for many years before TTD had renovated it a couple of years ago and started encouraging pilgrims to use that path. 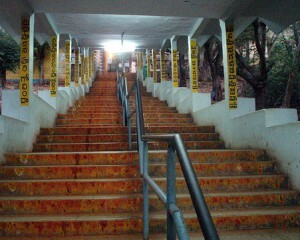 The decision to renovate Srivari Mettu was taken keeping in view the number of pilgrims trekking to Tirumala growing steadily. 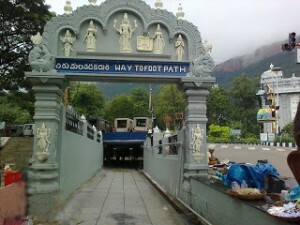 Divya Darshan, a quick and free darshan along with free accommodation and food, also lures pilgrims to tread this path. Srivaari mettu, which means the shoes of the god. All devotees offer their prayers to the deity and keep their shoes on their head. 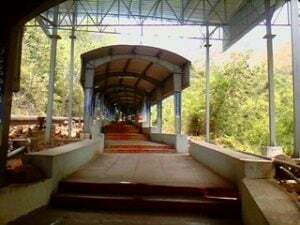 Now there is a huge change in the path way, T.T.D renovated the path with a roof covering to protect devotees from sun light and rain and lighting is provided. T.T.D has been providing all facilities to devotees along the foot way. T.T.D gives utmost priority to the pilgrims’ safety and security.Medical assistance is available all the way. Toilets are available through the entire way. 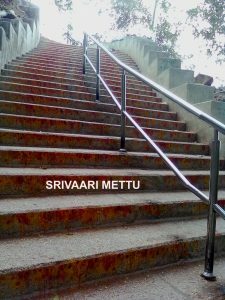 Tourists can reach Srivaari Mettu foot way starting point through T.T.D free buses which runs from Railway station, Bus station and Alipiri. Auto and Taxi are available for hire to reach basement of sri vaari mettu. I would advise not to take steps fast as you need much energy at later point. Whenever you are tired relax by seating next to the steps for a while by looking at the beauty around. whenever you feel like tired relax and the cool breeze will takeout stress and strain from you. You can take the support of railings to halt and proceed. 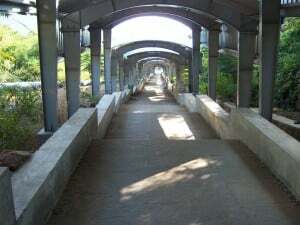 Most of the path is covered with concrete roof, so you need not worry about sunlight or rains. After covering a distance of 1250 steps, There is a free Divya Darshan Bio-Metric Token facility is available. Drinking water taps are available through out the path so you don’t need to carry water bottle. Through out the way good lighting and Fiber Shelter is provided. And announcements are being made using speakers to update pilgrims with Divya Darshan tickets and Timings. while on the way, you can find shopkeepers selling refreshments including snacks at a nominal cost. 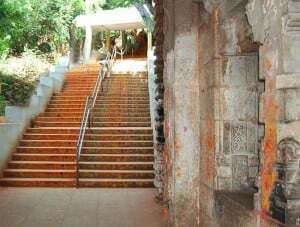 While on the path you will find people decorating each step with Pasupu(Turmeric), Kumkum and burning Camphor. Devotees whose wishes are fulfilled will do this activity. 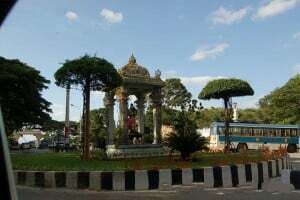 TTD runs free buses from Tirupati Railway station to Alipiri with a frequency of 40 minutes. 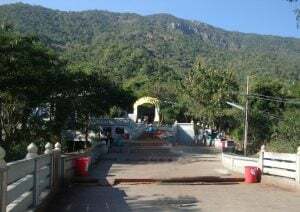 Pilgrims who intend to walk up the hills can use these buses right from 4 a.m.
For devotees who are planning to take Sri Vaari mettu, you can take buses going to Piler, Madanapalli, Baakarapeta, Ramgampeta and get down at Srinivasa Mangapuram Temple. Private vehicle can be parked at Balaji Link Bus Station at ALIPIRI if you are going by walk. Free transport of the Pilgrims luggage from the bottom to the Top of Hill. Water supply is provided along the way. Toilets for both ladies and Gents are available through out the path. Luggage depositing centers are available at Srivari Mettu and Alipiri Mettu Entrance. I am informed that Divya darshan coupons issued during srivari Mettu walk can take more time for God’s darshan since we will be joined in general Q. Can we get sheegra darshan 300/- coupons in srivari Mettu counters. Pls suggest how to get sheegra darshan after completing the walk in Srivari Mettu. We are planning to start at 6am complete the walk by 8am. Seegra darshan should be booked online for booking that online please call at 8500898000.